During the month of February, I was all about that #NaturalHairBLACKOUT life (tbh, I still am). So many of you have left encouraging words, pledged support, or let me know that you already #buyblack. Man, I gotta tell you... this ish is heartwarming. I had a conversation recently with a friend about how Black commerce is developing, and I gotta say -- I'm LOVING how Black businesses are investing in developing practical things that we need, like personal care and laundry products. When I first came up with the idea for the #NaturalHairBlackout, I almost backed out. How was I gonna replace my beloved Eco Styler? How would I get along without random product junkie sprees at Sally's and Ulta, for products that I'd likely return anyway? On a more serious note, how would I effectively care for my color-treated curls? Now that February is almost over, I can confidently say that I've been able to compile a list of proven, effective swaps. That's right, I figured out how to abandon holy grail cult favorites for natural hair, and support Black owned business. And guess what? My curls are thriving. These also happen to be the best cleansers IMO...just saying. The 411: The hallmarks of a great shampoo include thorough cleansing power, not stripping the hair dry, and having some sort of slip that doesn't leave the hair a tangled mess. All three of these shampoos hit the mark! If you're in the market for a sulfate-free shampoo that clarifies while hitting all the marks, Be Kekoa Be Clair is the way to go. 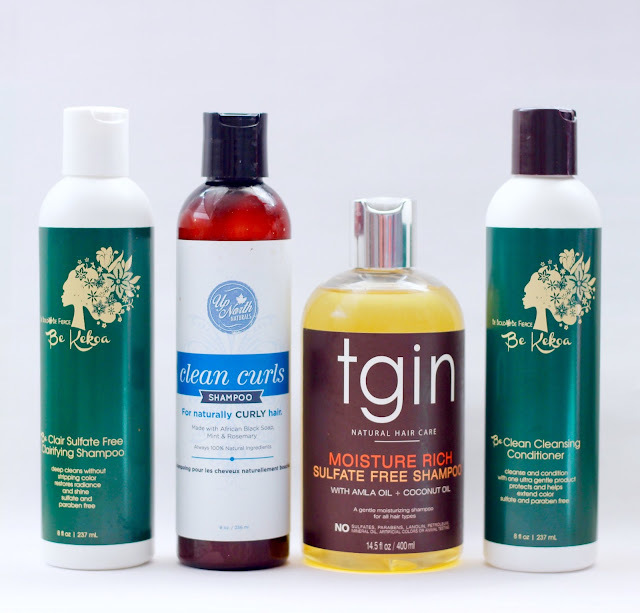 For a gentle, moisturizing cleanse, TGIN Moisture Rich Sulfate Free Shampoo is a clear winner. And if you're looking to harness the power of African Black Soap, Up North Naturals Clean Curls is the clear winner! The 411: This was huge for me guys. Eva NYC Therapy Session Hair Mask might not mean much to you, but for me, it was BAE. Super thick and creamy, with slip, protein, and buttery smooth realness, it was hard for me to let the pink jar of awesomeness go for a month. But in it's place, I discovered that Shea Moisture did not disappoint. I know, I know - we hashed out the Shea Moisture/Bain Capital situation a few months back. But since they still purport to be majority family owned (and Black owned), I gave them a pass. To replace DevaCurl's Heaven In Hair (a cult favorite among CG followers), I've discovered that Obia Naturals is a cost effective swap. It's pH balanced, botanically enriched, super moisturizing, and of course, Black owned. The 411: if you have color treated hair, or hair that craves protein in general, a strengthening treatment is a must. One of the reasons I wanted to back out of the #NaturalHairBLACKOUT initially was because I needed my ApHogee Keratin 2 Minute Reconstructor. Without it, my curls would go limp. 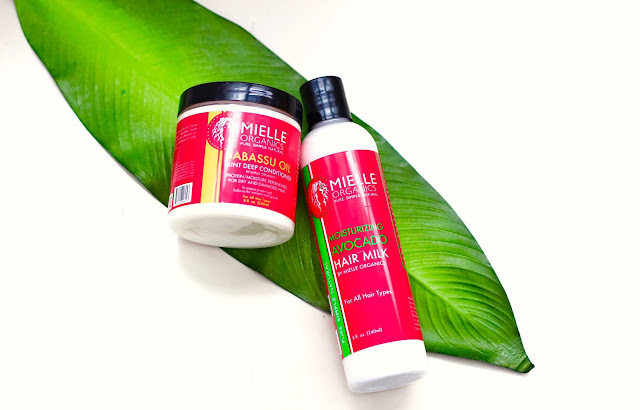 Luckily, I've discovered that Soultanicals Afrotastic Curl Elastic and Mielle Organics Babassu Oil Mint Deep Conditioner both contain the necessary ingredients to strengthen, repair, correct porosity, and restore elasticity in the hair. The 411: Both TGIN Green Tea and Mango Dip provide extreme slip, hydration, and moisture to hair of all types. They help calm frizz and set the foundation for long-lasting, soft styles. Every healthy hair regimen needs a good leave-in conditioner, and these two definitely hit the mark! The 411: Folks love Cantu for three reasons: it's affordable, readily available, and it works. I absolutely cannot knock that. But in the spirit of supporting Black owned brands, I present Mielle Organics Moisturizing Avocado Hair Milk and Eden BodyWorks Coconut Shea Curl Defining Creme. Mielle Organics is the more expensive of the two, but I love how intensely moisturizing it is. Plus, you can find it at select Sally Beauty stores nationwide (although you might have to fight somebody to get it, lol). Eden's Coconut Shea Curl Defining Creme is available on an even more widespread basis, and much more affordable. Both provide intense moisture, softness, and medium hold. The 411: The other reason I almost backed out of the #NaturalHairBLACKOUT? EcoStyler. Say what you will, but EcoStyler is bae. I even butchered dedicated a song to it. I wasn't quite ready to let it go for February, but I did. Guess what? Obia Naturals is the plug! I've always loved Curl Enhancing Custard, but it wasn't until I couldn't use Eco Styler that I realized how much I actually love and appreciate Curl Enhancing Custard. Multi day curl poppage!!! 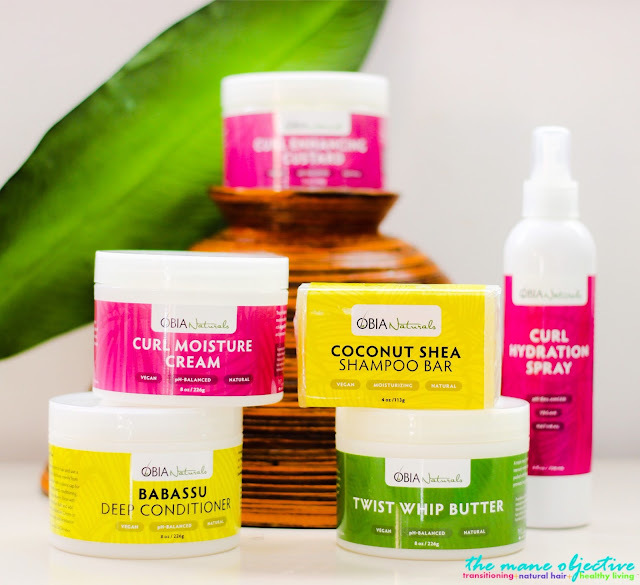 Obia Naturals Review - updated review coming soon! Black Owned Swap(s): At this point in 2016, there are a plethora of edge control options out in these #naturalhair streets. Seriously. 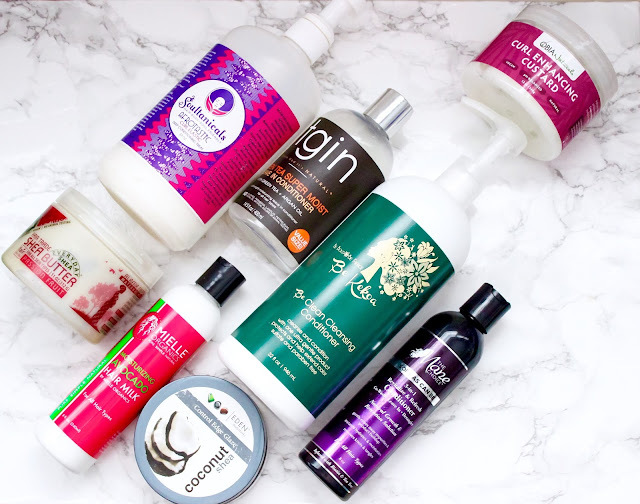 Eden BodyWorks Coconut Shea Control Edge Glaze (my fav), CURLS Passionfruit OR Blueberry Bliss Curl Control Paste, The Mane Choice Laid Back Effortlessly, and Mielle Organics Honey & Ginger Edge Gel are all viable options! The 411: With any of the aforementioned edge controls, your baby hairs will be super sleek, laid, and flourishing. Again, Eden BodyWorks makes my fave (CURLS Blueberry Bliss is a close second), but it really comes down to preference. Whichever you choose, you can't go wrong! Last but certainly not least, most of us (if not all of us) love Shea butter in some capacity - as a twisting cream, sealing balm, or softening product for our hair. I definitely recommend Kyra's Shea Medleys (Strength & Emollient Butter Cream is my love) for butter cream blends tailored to your hair needs. For pure Shea butters, Black Girl with Long Hair and Alaffia provide excellent, high quality and affordable options. 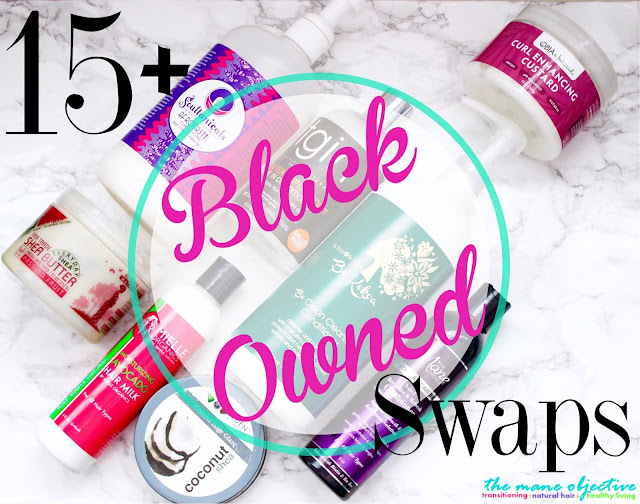 What are some of your favorite Black-owned swaps? Let me know in the comments below! Curious as to how you would react if you came across a site urging folks to make purchasing decisions based on skin color - but to buy only from white owned companies....just sayin. Other than that, as a fellow product junkie I love your product reviews and I think your hair is gorgeous. to economically uplift a community that has been systemically oppressed is the goal here. What would be the goal of purposefully supporting only white owned businesses? In the context of black hair, our hair is unique and we spend loads of money on it - money that rarely goes into the pockets of black people. AND considering that for centuries our black hair has been shamed and made to feel less than by others, does it make sense to give them our black hair money?